First off, I am so sorry for the lack of posts I have regarding my trip to New York City. There is honestly just way too much to talk about that I could not put it all in one post, but let alone separate each recap on top of publishing everything that’s occurring in the present. However, I have finally compiled probably what is my favorite NYC blog recap of all, and I thought that posting it as soon as possible would be best in case if I forget anything else, which hopefully won’t happen! Like the title says, you would definitely have to agree if you’ve been to New York City. Chelsea Market is practically a foodie’s heaven. If you want to watch the first portion of the Chelsea Market footage in my vlog, start at 1:34, and for the second half, start at 5:36. I decided to combine the recaps from both trips so that I wouldn’t have to worry about making two different sets of reviews, which means you’ll be getting everything from my visits! Before you read the actual reviews, do know that there are so many places to explore at Chelsea Market and I probably barely scratched the surface of the amazing things it has to offer. I do hope to return very soon and try new places that I haven’t visited this time, or possibly update on one of these restaurants below. Also, if you have ever been to Chelsea Market, please let me know what places I should visit that are not already listed here because I would love to check them out! Think Corner Bakery, but about two hundred million times better. It is honestly so devastating that Hale and Hearty Soups doesn’t exist in California because I’m missing their soups already. I’m normally not huge on the basic soup + sandwich or soup + salad lunch combination, but if I ate at this place every single day, I’d be converted for sure. I am so upset that I didn’t take a photo of my DIVINE seafood fra diavolo, because it looked just as delicious as it tasted. The broth was bursting with rich tomato flavors and the I asked to have it without rice and instead polished off some of my mother’s chickpea quinoa avocado salad that she willingly shared with me. However, you can take a look at the beauty if you click right here! Definitely a restaurant that is beyooooond words. To be frank, it doesn’t look like much when you initially visit, because this particular spot is quite small. If you watch some clips from my video which may or may not capture everything, you might see that there are no private tables and no formal waiting space, but there are several areas that sell rice and a cooling shelf with juices, raw meals and desserts (including sweet potato brownies and chocolate bites!!). The menu is pretty extensive with around eight rolls to choose from, each coming with its own sauce, aside from a sampler, dumplings, soups, side salads, noodle salads, rice salads, rice paper rolls, vegan desserts and some beverages. 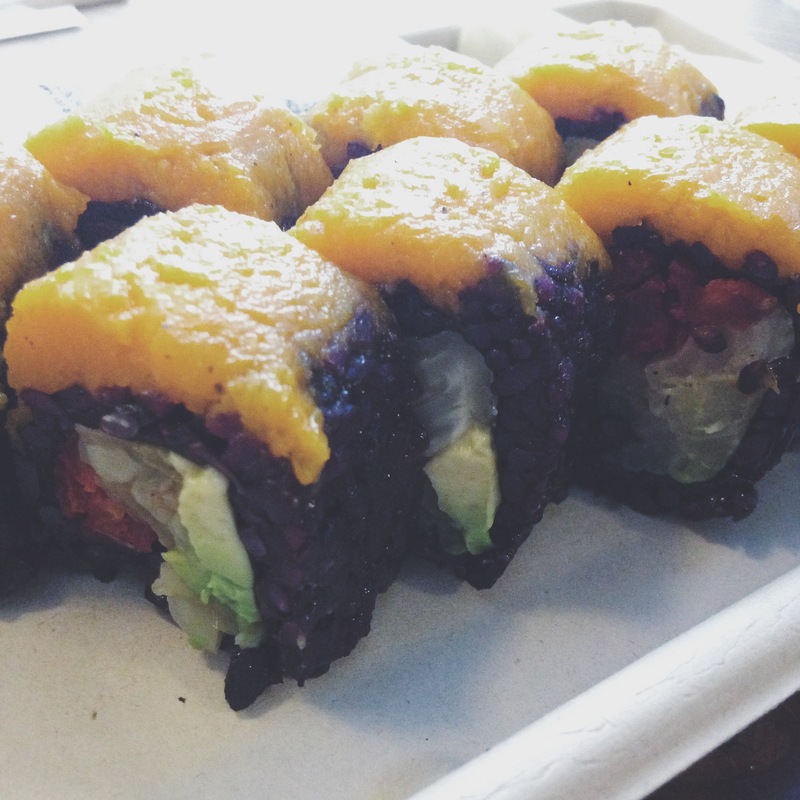 After the cashier’s recommendations, I ended up ordering the Sunny Side roll that consisted of black rice, butternut squash, sundried tomatoes, avocado, fennel, and an almond pesto sauce. It didn’t take too long for my roll to come out, and I was so excited to dig in until I opened the lid and realized how beautiful the roll was! Of course, hunger prevailed and I demolished it–but don’t worry, I did so in a way where I savored all the flavors and textures. The black rice was beautifully nutty and fresh and really complemented the soft and sweet butternut squash on top, and the creamy avocado complemented the tangy sundried tomatoes and fennel extremely well. And the almond pesto? PER-fection; it’s thick, rich, and not too pungent so you can still taste the roll even when you dip a generous amount in it. I also posted a Yelp review of Beyond Sushi because I loved it so much, so if you want to check it out, you can do so by clicking here! I didn’t actually purchase anything from Seed + Mill, but I was so amazed by the variety of tahini, sesame spices and halva that was offered at a vendor that was as small as a coffee shop! I did try something that I thought was some kind of dried or solidified tahini, but it turned out to actually be halva! If you don’t know what halva it, it is basically a combination of tahini and sugar that has been mixed at a very high temperature and then hand-stirring add-ins such as nuts, dark chocolate, herbs, spices or even rose petals. The flavor I sampled in the video was sugar free pistachio halva, and yes, there were sugar free alternatives being offered, which is awesome if you are watching your added sugar intake. I personally don’t worry about it too much, but I did want to save some room for the sorbet I was looking forward to later in the trip and further down in this post. That day, I was seriously craving something super spicy, flavorful and aromatic, so what could be better than Thai curry? Chelsea Thai was actually a spot that I looked up ahead of time, so I had it in mind during my second trip. The restaurant interior is very casual with a counter and few tables to dine, a condiment and spice shelf with Buddhist artwork, and a large bulletin board with the menu items and pictures. I was so thrilled when my red curry arrived, because I was famished even after the treats I ate beforehand. The curry broth was so spicy and flavorful from the red curry paste and chili, while being slightly sweet from the coconut milk! I was so happy to see that there was a generous amount of kabocha–my favorite! 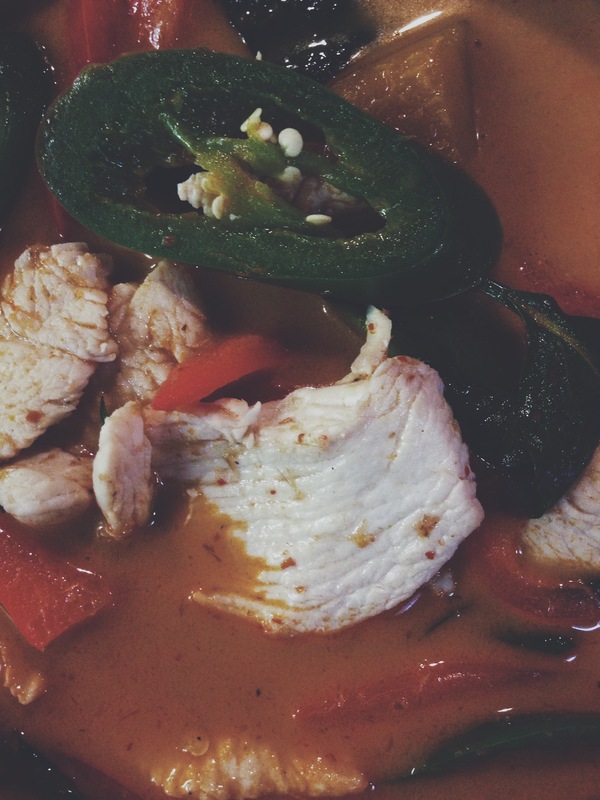 The red bell peppers, jalapenos, basil and chicken complemented the curry deliciously.Overall, I absolutely loved this curry and my Thai craving was more than satisfied. I was so happy that there was a separate selection of sorbets with a pretty generous variety. The majority of gelato places I visit only have three types of sorbets, but this had six! 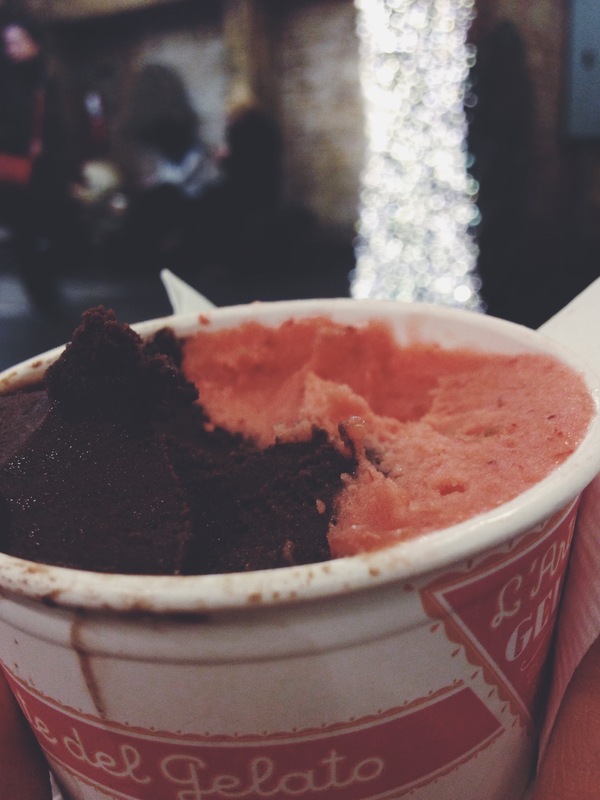 My dark chocolate sorbet was very strong in flavor and paired with the sweet and tarty strawberry sorbet perfectly. Both of these flavors combined together into one big fluffball of silky goodness! 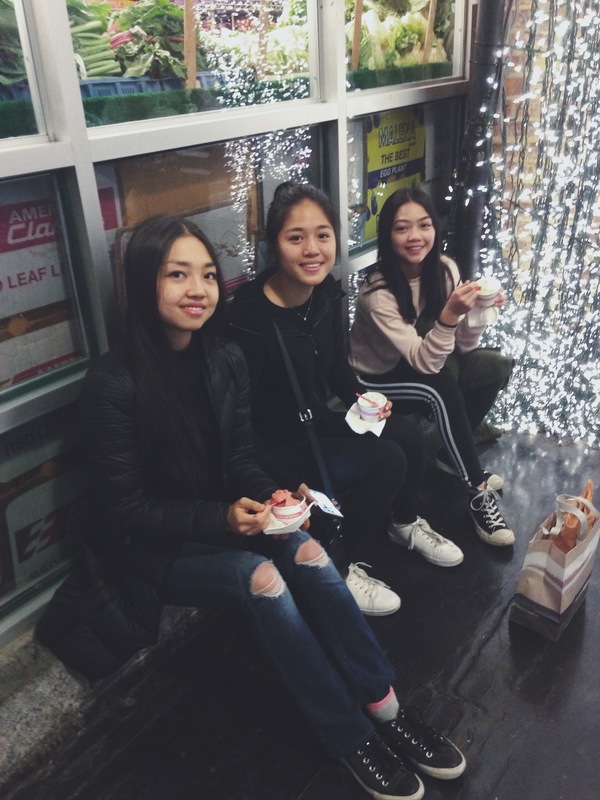 My sisters and I enjoyed our treats happily–but I was secretly really sad because we were leaving the same day! Ever been to Chelsea Market? What’s your favorite stop there? I am so jealous. Everything sounds incredible – I wish there were more photos to gawk at! Yes, everything was delicious! And I do wish I had more room for media on WordPress–I’m running out so I have to minimize the amount of photos I have until I purchase more storage space! Thank you! Everything tasted amazing–Beyond Sushi was one of my favorites and I highly recommend it! oh man oh man i need to make time to go here! ps just stumbled upon your blog through alison’s and i love it!